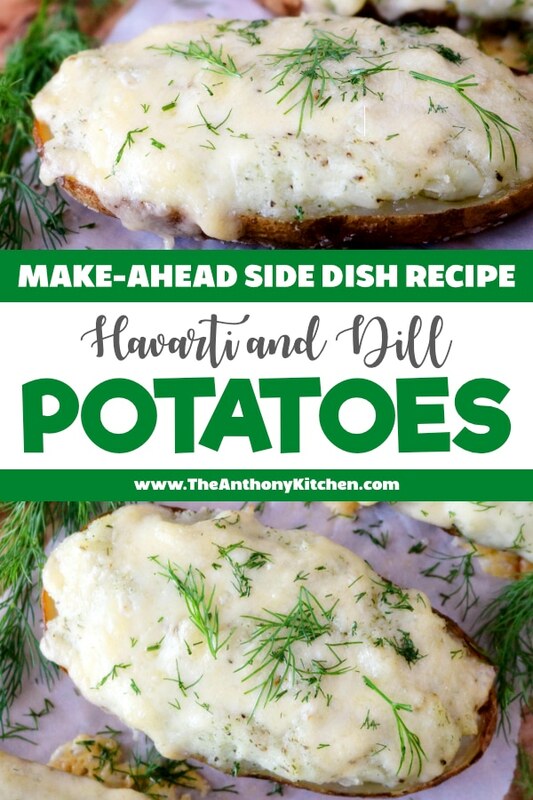 A recipe for perfect make ahead twice baked potatoes two ways! Try new Havarti and Dill twice baked potatoes or check out the classic bacon and cheese version. The perfect side dish for entertaining! STEAK AND POTATOES. YES, PLEASE. For many of you around the U.S., the warm weather strolls on in come summer, and it’s the perfect time to open up the windows and venture in to the great outdoors. The weather’s beautiful, the grills are fired up, and it’s officially cookout season. However, for those of us in Texas, the warm weather has pretty much always been here (save that two-month leave it begrudgingly takes come January and February) and then it’s back with a vengeance at the tippy-top of May. Oh yes, the Texas summer is hot, and we’re lucky if we get a day below 90°. But, that won’t keep us away from the grill. Oh, no. Because just like you, we love a good flame-grilled steak, and nothing, not even the blazing Texas heat, could keep us at bay. Since it’s grilling weather year-round in my neck of the woods and my husband just so happens to have a BBQ addiction, we host cookouts regularly. I’m always hunting for fun sides to pair alongside flame-grilled, juicy ribeyes. Potatoes are a classic steak pairing everyone enjoys, but the one we all likely enjoy the most, is none other than the twice baked potato. And the one I enjoy the most for entertaining purposes? 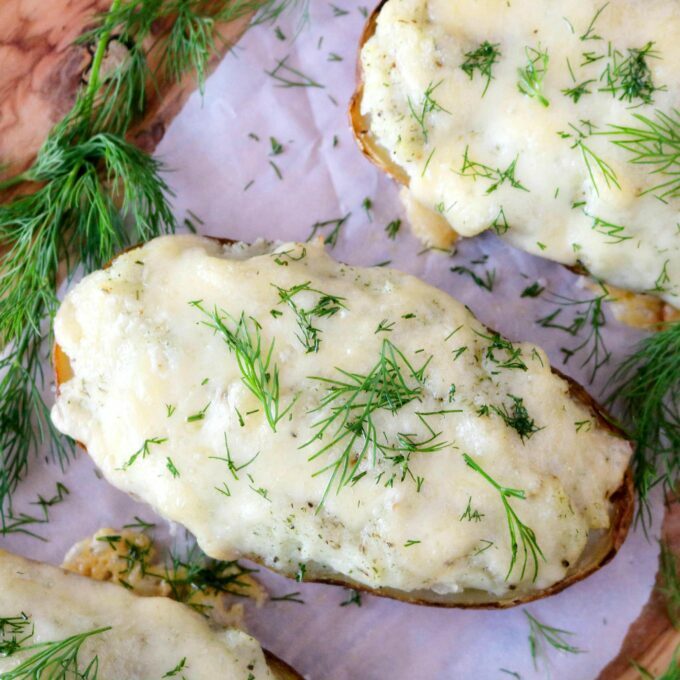 Make ahead twice baked potatoes. 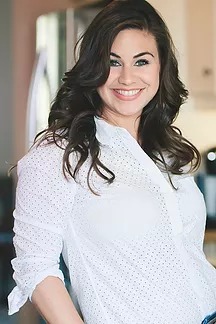 As much as I love a good excuse to get out of the Texas heat, I prefer to spend my time at parties with my guests, not hunkered down in the kitchen. Make ahead twice baked potatoes allow you to get all of your prep work done ahead of time, and you only need to pop them in the oven 30 or so minutes before the meat comes off the grill. Twice baked potatoes begin just like an oven-baked potato. To start things off, you’ll scrub the potatoes clean of any dirt or debris, then pat them dry. Place the potatoes on a sheet pan, drizzle them with canola oil and give ’em a hefty sprinkle of Kosher salt. This helps the skin to crisp up nicely and adds a great deal of flavor to the outside of the potatoes. It’s actually one of my daughter’s favorite parts of twice baked potatoes. After you’ve shown the outside a little love, it’s off to bake in a 425° oven until they are perfectly tender on the inside. Once the potatoes have cooked through, they’ll come out of the oven and will need a little time to cool down. You don’t want to slice into a piping hot potato…nor do you want to hold one in your hand. Speaking from experience. Patience has never been my strong suit. After about 10-15 minutes, you should be to handle the potatoes without setting your hands on fire. With the potatoes on a cutting board, carefully cut them in half lengthwise, using a sharp serrated knife and a slow-going, gentle sawing motion. Then, you’ll use a spoon to scoop out the filling, leaving about an 1/8″ border of potato flesh lining the skin. The flesh of the potato goes into a mixing bowl, and it’s time for the fun part. Potatoes are such a versatile vegetable and take on so many flavors well. 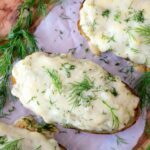 Surely we’re all aware of the classic twice baked potato recipe that features grated Cheddar cheese, pan-seared bacon, and chives, but if you want to shake things up without losing any points in the flavor department, you might want to try these Havarti and Dill make ahead twice baked potatoes. Havarti is a super creamy and mild cheese, and it melts down to total perfection. 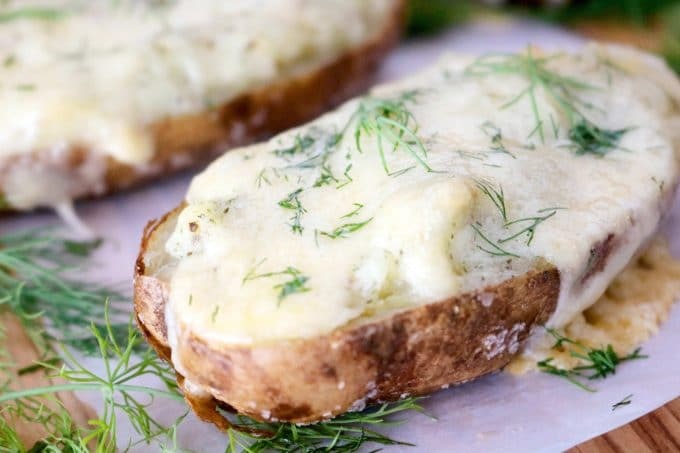 Dill is a classic pairing for Havarti cheese, and just so happens to be a perfect pairing for potatoes as well. Combine the three and you’ve got a twice baked potato trifecta that can’t be beat. And that’s saying something considering the alternative version is loaded with bacon and cheese. In fact, it might be downright blasphemous…but none-the-less, true. Regardless of the twice baked potato filling you choose, the method for stuffing them stays the same: Add your mix-ins (e.g. cheese, bacon, herbs, etc…), stir it up, and add filling back into the potato skins to stuff to the brim. TOP ‘EM OFF. BAKE ‘EM TWICE. 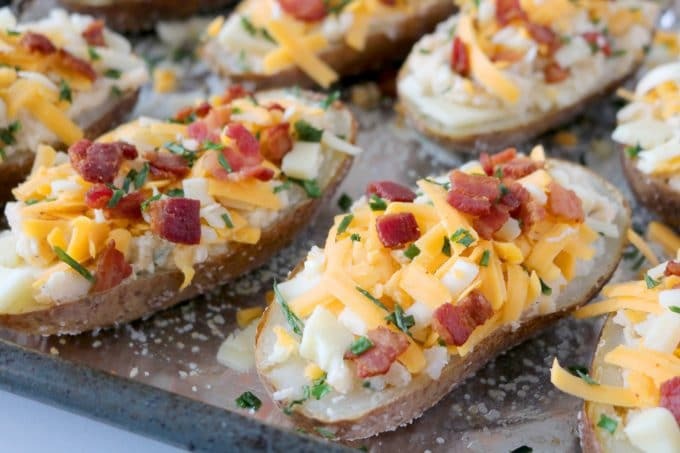 Then, to make your twice baked potatoes even better, you top them off with more cheese, and maybe an extra sprinkle of bacon or herbs if you’re feeling generous. Once the potatoes have been stuffed, they’re returned to the oven on a lower heat setting for about 20 minutes or so. Just long enough for the cheesy filling to melt down and blend in with the other added ingredients. For entertaining purposes, it’s always nice to have as much done in advance as possible and for the food to be hot when your guests actually eat it. Again, emphasizing why these twice baked potatoes are perfect for cookouts! After the potatoes are stuffed and before they go back into the oven for the second go-round, you would simply cover your baking sheet with foil or plastic wrap and place them in the refrigerator until about 30 minutes or so prior to serving time. All that’s left is to bake them and serve them alongside a hot, sizzling steak. However, these make ahead twice baked potatoes are certainly not limited to a steak side dish. They’re perfect for any BBQ and just about any potluck gathering, because really, who doesn’t love a twice baked potato? Especially one loaded down with creamy Havarti cheese and tangy dill? If you’re looking for a more traditional twice baked potato, click here for the bacon and Cheddar version. Whichever version you should choose to serve up, as always, enjoy! 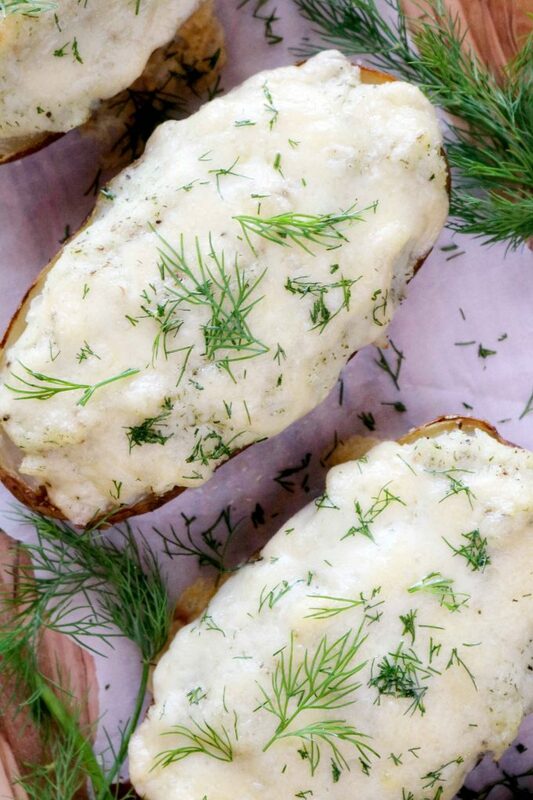 A recipe for perfect make ahead twice baked potatoes with Havarti and Dill! Preheat the oven to 425° and have ready a rimmed baking sheet lined with aluminum foil. Place the potatoes on the baking sheet, drizzle with oil, sprinkle with 2 teaspoons Kosher salt, and rub all over to spread the oil and seasoning evenly. Bake for 1 hour. Pull out the potatoes and allow to cool for 10-15 minutes, or until no longer piping hot, before handling. Place the potatoes on a work surface, and using a large, sharp knife, cut them in half lengthwise. Scoop out the flesh of the potato, leaving about a 1/4" - 1/8" border along the edges, and transfer to a mixing bowl. Add the butter, dill, 1 teaspoon Kosher salt, black pepper, sour cream, and 1 cup of the Havarti cheese. Mash and mix well using a wooden spoon, or you could use a handheld mixer on low speed. Do not over mix. Spoon the filling back into each potato, and top with a generous pinch of the remaining Havarti cheese. At this point, for make ahead twice baked potatoes, cover the potatoes with plastic wrap and refrigerate until ready to bake. Remove the plastic wrap before baking. To bake the potatoes, preheat the oven to 400°. Bake the potatoes for 20-24 minutes, just until the cheese is slightly bubbly around the edges. Garnish with a sprinkle of dill if desired. Serve warm and enjoy. 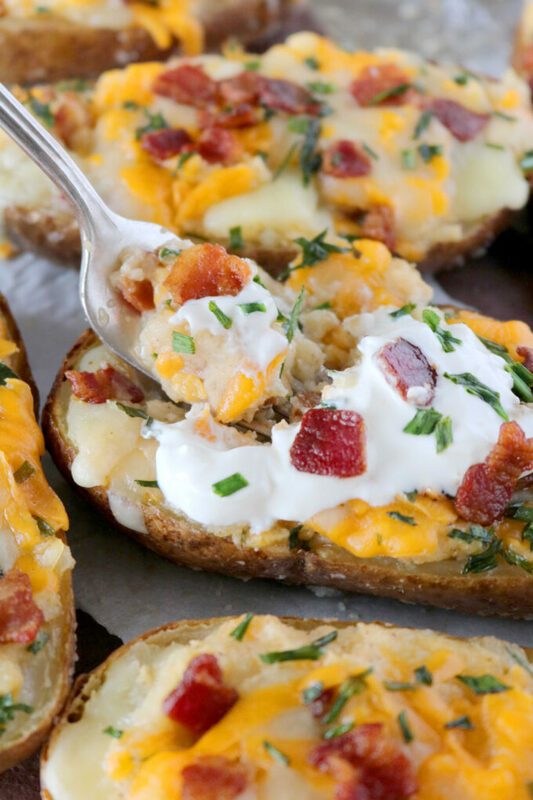 See "Twice Baked Potatoes" for the classic bacon and cheese version!